You may have heard about the 2010 Revit User Interface… now you can see it. Learn how the improved desktop organization, larger drawing space, and quicker access to tools and commands in Autodesk Revit Architecture 2010 software can help you work more efficiently. SAN FRANCISCO, May 20 — Autodesk announced that its Autodesk Gallery at One Market in San Francisco and newly renovated office space in the historic Landmark Building at One Market has received Platinum certification in the U.S. Green Building Council’s LEED for Commercial Interiors (LEED-CI) rating system. The Autodesk offices are one of only four Platinum-certified projects in San Francisco, and second in the state of California under the commercial interiors rating. 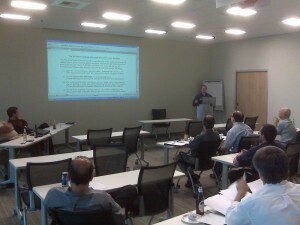 I attended the Revit User Group – Inland Empire (RUGIE) meeting. The group has been meeting for some time and it has been hosted by WLC Architects and HMC Architects. The meeting was at HMC Architects. The first item of business was a demo of SmartBIM Library by Andrew Arnold of Reed Construction Data. SmartBIM Library is a Revit content hosting program with Revit Families collected up directly from manufacturers. Presentation levels desired: 40% beginner, 15% intermediate, 10% advanced and 35% said mix it up. Adding 3D engraved model text to your project. 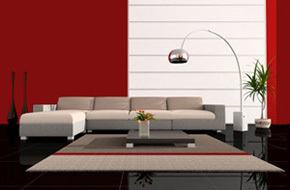 Add text to the wall – introduce a negative value so ti pushes into the wall. Use the Join Geometry tool to link the text to the wall. Then set the model text material to 100% transparency. Switching Model lines to Detail lines and back. Model lines show up everywhere – Detail lines only show in the View. The workaround is that anything you paste from the clipboard takes on the attributes of the Mode you are pasting into. Cut the lines to the clipboard. Paste the clipboard into the sketch - this converts the model lines into detail lines. Select the lines again and copy them back into the clipboard.